Sudocof Syrup: Each 5 ml syrup contains Dextromethorphan Hydrobromide BP 10 mg, Pseudoephedrine Hydrochloride BP 30 mg and Triprolidine Hydrochloride BP 1.25 mg.
Sudocof syrup is a mixture of antitussive, decongestant and antihistamine agent. Dextromethorphan is used to suppress dry cough. Dextromethorphan is safe, effective and non-narcotic antitussive. It blocks the cough reflex in situations where the dry cough serves no purpose. It does so by calming the cough centre of the brain that governs the coughing reflex. Dextromethorphan does not induce tolerance, and has no potential for addiction like opiates. Pseudoephedrine acts by stimulating alpha-adrenergic receptors. Pseudoephedrine acts on receptors in the muscles of the blood vessel walls, causing them to contract. This results in narrowing of the blood vessels and decreased blood flow in the lining of the nose and sinuses. Thus fluid congestion in the nose and sinuses is reduced. Triprolidine is a strong antihistamine, which acts on histamine (H1) receptors. Antihistamines block the action of histamine, preventing dilatation of blood vessels, reducing redness and swelling. It may cause mild drowsiness. 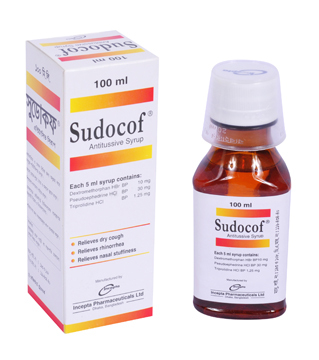 Sudocof, the combination of Triprolidine, Pseudoephedrine and Dextromethorphan is used to relieve the symptoms of colds and flu, runny nose, nasal congestion and cough, where these are associated with dry cough. Few side-effects to be associated with this medicine are known. Because a side-effect is stated here, it does not mean that all people using this medicine will experience that or any side-effect. Rash, difficulty in passing urine (urinary retention), disturbed sleep, drowsiness, disturbances of the gut such as diarrhoea, constipation, nausea, vomiting or abdominal pain, hallucinations, tachycardia, dry mouth, nose and throat are occasionally reported. Pregnancy: There is no safety information on the use of this medicine in pregnancy, but it has been widely used for many years without apparent ill consequence. It should be used with caution during pregnancy.